One of the first questions raised was what were the main competitive advantages of digital business models and to what extent regulations have had a significant impact on their success. According to José Luis Ortin, a Garrigues partner in the Corporate and Commercial Law Department, disruptive technology is having a transformative effect on all kinds of businesses. He explained that the ability of the technology to reduce costs in the value chain through disintermediation and immediate access to a global market are identifying features of successful business models in the digital economy. However, he pointed out that it was precisely this global aspect that is frequently found to be at odds with local sector regulations. Despite international efforts to homogenize regulations, the disparate rules of different jurisdictions are one of the main challenges for digital business managers, and so in order to adapt and adjust, a sound knowledge of the regulatory context is essential. How can data value be protected? Another key aspect is the appropriate management of the data handled by businesses, both in new and traditional business models. Alejandro Padin, lawyer responsible for IT and privacy at the Garrigues Madrid office, underscored the fact that properly processed personal data are sources of income and create value for companies. In fact, he recalled, there are many examples of businesses whose main asset is data which need to be adequately protected. In his view, there is a need to change perspective, with an approach that focuses on asset management rather than risk management, taking into account the considerable value that data can bring to businesses. Regarding this question, Cristina Mesa, chief associate in Garrigues' IP department, commented that big data is protected by the sui generis database right. This protects the effort invested in creating a data base, compilation of which is a considerable undertaking and yet which is very "cheap” to copy. Mesa provided an example, recalling how members of the firm had been involved in a court case in Spain concerning the infringement of an extremely complex pharmaceutical marketing database, and had obtained indemnification amounting to over 5 million euros, the highest amount awarded in the EU to date for infringement of this right. During the debate, the question was raised of how relevant algorithms are in new business models of the digital economy. Cristina Mesa explained that as they were mathematical formulas they could not be patented, however, they could be protected as industrial secrets, provided that they fulfil a series of requirements (the information needs to be secret, it must have commercial value, and it must be possible to attest that reasonable efforts have been made to keep the information confidential). As Critsina Mesa recalled, a new trade secrecy law is in the pipeline, and this may result in some significant changes in this area, which would give considerable support to this type of asset. She also mentioned software protection. She explained that what is interesting in this regard is not so much what is protected as what is not, that is, it is important to determine which matters are excluded from copyright protection. She went on to add that the CJEU has made it clear that protecting functionality would be like protecting an idea. And this is a key concept in intellectual property matters; ideas are not protected, otherwise competition would come to an end, along with technological progress. Is this the end of paperwork? It is also important to take into account that new ways of doing business require less bureaucracy, and they are far more speedy and dynamic. The question is how to achieve this in everyday procedures, such as incorporating a company or signing an agreement with effects for third parties. José Luis Ortín pointed out that for some time now it has been possible to register a new limited company (SLNE), enabling the remote incorporation of a business, thus reducing time spent with notaries and registrars to 48 hours, but nonetheless with a number of limitations and inflexibility that in many cases tend to make it an unattractive prospect. He also mentioned developments in digital signature which is currently in the process of adaptation, and pointed out that the EU is pushing strongly for this in all these matters. In fact, on 24 April, the European Commission presented a project known as the Company Law Package which is promoting digitalization of corporate law. Use of electronic signature is also becoming prevalent in the employment field. Eloy Castañer, partner in the Garrigues Labor and Employment Law Department, explained that Spanish and European regulations consider three types of standard electronic signature: standard, advanced, and recognized or qualified electronic signature. Any of these three kinds of signature will have legal effect, and will be legally valid, but he emphasized that only recognized electronic signature can have the same value as a written signature in the case of submitting legal evidence. Castañer also addressed use of the biometric signature (which permits biometric data to be captured during the process of written signature on electronic devices, such as pressure of the pencil or speed of writing etc.) and indicated that they could be included in any of the forms of electronic signature described above. Have electronic relations with the public authorities improved? These types of questions are not only relevant to the private sector. Technology is also having repercussions in the public sector. Although the typical image of the public authorities is that of a mountain of paperwork, according to Javier Manchado, partner in the Garrigues Administrative Law Department, there has in fact been a change in recent years, and the principal laws in connection with the public authorities (procedure, contracting etc.) are taking this matter very seriously. For example, since March of this year, the Public Sector Contracts Law requires that all procedures be carried out electronically. There are also some striking cases which go much further, such as the Government of Aragon which is promoting the use of Blockchain technologies in public tenders. However, in his view, the electronic administration still has a long way to go. The "generalization” of the electronic medium in respect of the public authorities resulting from the most recent regulatory reforms will still take some time to become an effective reality, as it involves considerable technological input and a change of mentality, both for the authorities and citizens alike. He informed attendees that despite the fact that legal entities are required to interact electronically with the authorities, the reality is that putting into practice the goal of "zero paper" is having a varied response, (it is proving more effective on a national and regional scale than at municipal levels for example, and it is a gradual process entailing some practical difficulties that often need to be resolved on a case by case basis. And what about robots? Will they be subject to the law? Robotization raises some major challenges from a tax and employment perspective. Eloy Castañer confirmed that there is a whole debate currently underway regarding the impact that robotization and artificial intelligence could have on employment and the sustainability of our social protection system, which has led to the idea that a contribution (or fee) could be exacted for the use of robots, or more generically for use of the technology or its advantages. Apparently, although current labor laws do not envisage contributions from "electronic persons", it is not a totally outlandish idea for the future. The European Parliament has drawn up a report with recommendations in this regard, and it has also been recommended by some Spanish unions. And will robots also pay taxes? Álvaro de la Cueva, Garrigues partner and expert in international taxation, recalled that only last year, Bill Gates mentioned that one day robots would have to start paying taxes. In this regard, he indicated that the first thing that would have to be considered is what exactly is a robot, and also to bear in mind that it is the robot's owner who has the economic capacity and so it is he or she who could be subject to taxation, for example, with a salary attributed for a sum equivalent to the salaries “saved” by having replaced actual workers. However, aside from robots, technological disruption raises a whole series of questions in other fields such as, for example, in respect of tokens. Do they involve any kind of tax payment? De la Cueva responded to this question indicating that a token is equivalent to a "voucher for" and this is how the appropriate tax system should be determined, considering that, based on how it is legally defined, VAT may well be applicable, or there may even be implications for Corporate Taxation or personal income tax, among other charges. During the 1st Garrigues Digital Forum start-ups were also in evidence. 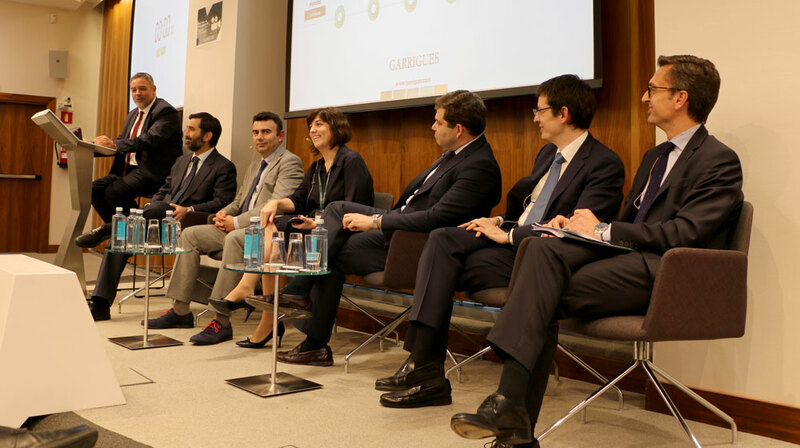 A round table on Start-ups & Open Innovation moderated by Garrigues of counsel, Alejandro Sánchez del Campo, welcomed speakers as specialists and representatives of the entrepreneurial ecosystem. Taking part were Nacho González, senior associate at Meitar LiquornikGeva Lehem Tal; Daniel Sánchez, general partner at Nauta Capital; and Manuel Delgado, from Leads Origin. Regarding the situation in Spain, both Daniel Sánchez and Manuel Delgado were confident that the entrepreneurial ecosystem in Spain is doing well, although it still has a long way to go. "We are seen as one of the more interesting areas in Europe” underlined Sánchez. As to regulation, Delgado emphasized the need for greater clarity in the terms in which regulations are applied. "It is clear that things are being done for entrepreneurs but it is not always so clear what the concept of entrepreneur really means" Daniel Sanchez pointed out that often “a cross-cutting approach is needed for the whole entrepreneurial sector." In respect of what is required from lawyers, Manuel Delgado stressed the importance of demonstrating capability in order to ensure that the measures taken today will not affect the business in future. And Daniel Sánchez mentioned the need for “the lawyer to feel to some extent on top of the entrepreneur's problems"
Big technologies also shared their experience with over hundred attendees at the event. In a discussion group led by Garrigues partner Carolina Pina, the contributors were María Álvarez Caro, Google public policy & government relations manager for Spain and Portugal; Stefano Fratta, big data, consumer & fintech manager at Telefónica Digital; Natalia Basterrechea, Facebook head of policy; and Lidia Peyrona, IBM's legal manager for Spain, Portugal, Greece and Israel. The speakers were clear in highlighting the impact of technology in changing people's lives, and all were in agreement that it was imperative for people to gain more competence and skills in this sphere. All the speakers agreed that reducing the digital gap is an essential requirement, and that society needs to provide more training in digital competence. They also emphasized the need to highlight the virtues of technology and also to take this into account when drawing up regulations. María Álvarez Caro wished to make it clear that “we are currently undergoing a period in which technology is being questioned because of its inherent risks, when in actual fact, technology is neutral, and what varies is the use that we make of it". Natalia Basterrechea spoke in similar vein, calling for a need to approach technology from the perspective of the advantages that it affords and how it helps to improve people's lives. Lidia Peyrona added that one of the biggest legal challenges faced is that of algorithms and the importance of transparency, and the ability to provide explanations. In this regard, she advocated testing the result of those algorithms to ensure that they are aligned with human values. And in the corporate sphere, Stefano Fratto pointed out that "in a context of legal uncertainty, if technological businesses place the client at the center of their risk analysis, the decisions reached are usually correct".